Grant K. Gibson - the blog: Why does IKEA do this? Why does IKEA do this? Elliot really would enjoy having coloring and snack time at a table just like this! In the mean time I am lighting candles for the Swedish gods tonight in hopes that this appears very soon. In the mean time he is enjoying his new toys GYFFY and the wooden alligator (late Xmas and an early 2nd birthday present). The Gyffy is super cool - What a lucky kid. Absolutely annoying! But, those cute toys and their adorable owner may just need a better selection! love the concept of quick and cheap. hate the concept of "throwaway" furniture. I totally agree with Acanthus and Acorn. in agreement...The toys are sooo adorable. I seriously hate when stores do that! Good luck on your hunt. Let's not disappoint him. There is a nicer set by Ikea on ebay for sale. Check out item number: 280390503095. Good luck. Now how does one search by item #? I just tried to figure that one out but it didn't work in the search field! Do help! On the search bar click on the "Advance search" located just to the right of it. A new page comes up. enter the item number. It should work. 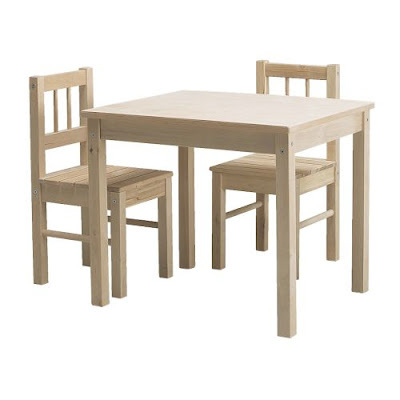 Or, just type in "ikea children's kids table & 2 chairs set" and enter. Let me know if it worked. Oh I saw that one. Elliot's mother wants one with a wood top to it! More eco-friendly. I will keep looking. Grant, I have this set and you are welcome to have it if you would like it shipped to you. I bought it for my grandchild when he came to visit, but has hardly ever been used. Let me know. Wow! I would buy this set from you and send you whatever for the shipping too. Is this the one with the wood top. For some reason it has been so hard to find! I got a good laugh out of your FB Elliot updates. Looks like you all had fun! Delighted that I could be of help. Please find my personal info. through your email. i was at ikea about a week ago and i did see this there - it appeared to be somewhat new. so that bodes well, i'd think, for it appearing at other locations in the near future. If the (so totally generous) anonymous 619 post doesn't work out, check out chicago craigslist. Available. And just an fyi, chicagocraigslist is the capital city for all things Ikea. We have two Ikea's within 30 mins of the city and it seems that everyone shops there and sooner or later they shop there some more and put the older purchases on craigslist! Good luck! Thank YOU so much for your help as well. ANON 6:19 is sending the set! It's that the nicest thing in the world! Thank you so much again ANON 6:19! I agree with "throw away" items and being torn. I think that I was after this specific for the price and I knew it would be put to good use for years to come for two children. But overall I don't think that "throw away" is the best way to go with the environment. This is one reason that I love working with vintage items and re-doing them. Giving them new life is the ultimate in the "green designing". My twin boys had the same alligator pull toy. It was so cute and very durable. We passed on it to some other lucky kid.